The coalescence of two black holes — a very violent and exotic event — is one of the most sought-after observations of modern astronomy. But, as these mergers emit no light of any kind, finding such elusive events has been impossible so far. Colliding black holes do, however, release a phenomenal amount of energy as gravitational waves. The first observatories capable of directly detecting these 'gravity signals' — ripples in the fabric of spacetime first predicted by Albert Einstein 100 years ago — will begin observing the universe later this year. When the gravitational waves rolling in from space are detected on Earth for the first time, a team of Northwestern University astrophysicists predicts astronomers will "hear," through these waves, five times more colliding black holes than previously expected. Direct observations of these mergers will open a new window into the universe. "This information will allow astrophysicists to better understand the nature of black holes and Einstein's theory of gravity," said Frederic A. Rasio, a theoretical astrophysicist and senior author of the study. "Our study indicates the observatories will detect more of these energetic events than previously thought, which is exciting." Rasio is the Joseph Cummings Professor in the department of physics and astronomy in Northwestern's Weinberg College of Arts and Sciences. Globular clusters (spherical collections of up to a million densely packed stars found in galactic haloes) could be factories of binary black holes (two black holes in close orbit around each other). The sensitive new observatories potentially could detect 100 merging binary black holes per year forged in the cores of these dense star clusters. (A burst of gravitational waves is emitted whenever two black holes merge.) This number is more than five times what previous studies predicted. "Gravitational waves will let us hear the universe for the first time, through the ripples made by astronomical events in spacetime," said Carl L. Rodriguez, lead author of the paper. He is a Ph.D. student in Rasio's research group. "Up until now, all of our observations have been from telescopes, literally looking out at the universe. Detecting gravitational waves will change that. And the cool part is we can hear things we could never see, such as binary black hole mergers, the subject of our study," he said. Rodriguez and colleagues used detailed computer models to demonstrate how a globular cluster acts as a dominant source of binary black holes, producing hundreds of black hole mergers over a cluster's 12-billion-year lifetime. By comparing the models to recent observations of clusters in the Milky Way galaxy and beyond, the results show that the next generation of gravitational-wave observatories could see more than 100 binary black hole mergers per year. Advanced LIGO (Laser Interferometer Gravitational-Wave Observatory) is one of the new gravitational-wave observatories. Slated to begin operation later this year, Advanced LIGO is a large-scale physics experiment designed to directly detect gravitational waves of cosmic origin. Laser interferometers detect gravitational waves from the minute oscillations of suspended mirrors set into motion as the waves pass through the Earth. Rasio and Rodriguez are members of Northwestern's Center for Interdisciplinary Exploration and Research in Astrophysics (CIERA). The image at the top of the page shows thev galaxy known as Markarian 739, which is actually two galaxies in the midst of merging. 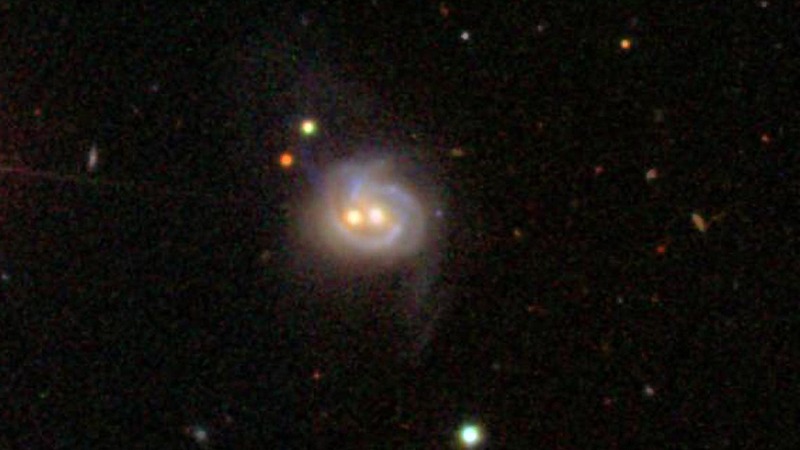 The two bright spots at the center are the cores of the two original galaxies, each of which harbors a supermassive black hole. (SDSS).